To bring people together to help put an end to racism and defamation. We will inform and educate, by carrying out research, to bring issues to light. We will form partnerships, through various networks and the use of media, to achieve our goals. 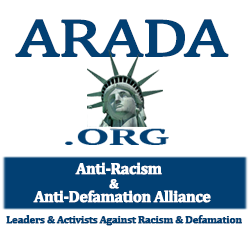 ARADA is a registered non-profit organization (501c3 status pending) that is against racism and defamation against all persons/groups/organizations. We are open to any and all individuals and groups who share our vision or who have been directly or indirectly victims of racism and defamation. We have no affiliations based on race, religion, politics, religion, ethnicity etc. We welcome partnerships with anyone who shares our vision. We will provide research on various topics/issues, to educate and raise awareness. We serve as a resource for anyone interested in our vision and the work that we do. We address issues such as hate crimes, Internet or cyber bullying, bigotry, and ensure the adherence of children’s rights, women’s rights, immigrants’ rights, gay rights, religious rights, etc. We seeks to provide a novel approach to anti-racism and anti-defamation advocacy by applying recommendations from our network of leading researchers in the field.